It was a bout of period pain that led to Liu Yanan’s first taste of donkey gelatine. The 13-year-old was visiting family in Beijing when her cramps started for the first time. Her aunt took out an ornate box filled with smooth chocolate-brown slabs, broke off a small piece, and stirred it into a pot of sweetened rice porridge. That was back in 2004, and since then China’s ejiao industry has turned into a global megabusiness. What was once a humble blood tonic for conditions like anemia – a claim supported by no clinical evidence – has been rebranded as a wellness product for China’s ascendant middle class, and now features in face creams, sweets and liqueurs, as well as a wide variety of medicinal preparations. There are claims it will help with anemia and acne, boost your energy, improve your sleep, nourish your yin, prevent cancer, make you look better and even improve your libido. It is billed, in short, as a miracle elixir. In Dong’e County, a remote province which is home to almost 90% of all Chinese ejiao factories, dozens of ejiao stores flank the town’s streets. There are ejiao adverts on billboards and at bus stops. The nearest airport, in the city of Jinan, has booths selling ejiao and fresh donkey meat, a regional delicacy. Dong-E E-Jiao (Deej), the world’s largest producer, has headquarters that include seven monolithic factory buildings, a giant conference hall, a visitor’s centre that resembles Beijing’s iconic Bird’s Nest stadium, and an immaculately landscaped lake. The company’s most expensive products, prepared according to custom on the winter solstice each year, cost £2,900 per 250g at discount Deej outlets in town, with cheaper varieties at a tenth of the price. In 2016 Deej (listed on the Shenzhen stock exchange) reported sales of £700 million— more than double its revenue four years ago. But behind the facade of this increasingly glossy sector, with its product placements on Chinese TV shows and shiny packaging, is an international trade that is upending rural economies around the world. According to industry statistics, Chinese ejiao production consumes some 4m donkey skins per year. China’s donkeys numbered 11m two decades ago, but this figure has fallen below 6m, both as a consequence of booming ejiao production and the mass migration of rural Chinese, who formerly raised donkeys, into cities. Domestic supply is capped at less than 1.8 million and this leaves Deej and its smaller competitors heavily reliant on imports. Here is where the problems begin. In less than a decade demand for skins has inflated donkey prices beyond what locals can afford – in Kenya the cost of a donkey has more than trebled in the last year. Communities that rely on donkeys as pack animals no longer have access to a resource that until recently was abundant and cheap. First domesticated in Africa around 5,000 years ago, donkeys have supported subsistence livelihoods around the world for hundreds of generations, adept at drawing heavy loads and temperamentally easy to handle. Their sudden emergence as a globally traded commodity has disrupted traditional cycles of use: around the world donkeys are no longer worth more alive than dead. Some countries are now clamping down on international trade. Nine African governments (Botswana, Burkina Faso, Mali, Niger, Nigeria, Senegal, Ghana, Tanzania and Uganda) have banned donkey skin exports, with a further four (Burkina Faso, Botswana, Tanzania and Ethiopia) closing down slaughterhouses funded by Chinese firms. Gambia, Malawi and Zimbabwe have expressed concern but not yet introduced a ban. But in response portions of the trade have shifted underground, with convoluted networks illegally supplying factories in China. Poor regulation has led to an explosion in donkey theft; in Kenya, inspectors recorded almost 1,000 stolen animals between December 2016 and April 2017. Philemon Sibaya, a subsistence farmer in South Africa who used to run an informal delivery business with donkey trailers built from old vehicle parts, had his donkeys stolen last November. He used to allow them to graze freely at night, loosely tethering their hind legs to stop them straying too far. “But that morning I couldn’t find them,” says Sibaya. Unregulated “bush slaughter” facilities are now multiplying across Africa, Asia and South America. 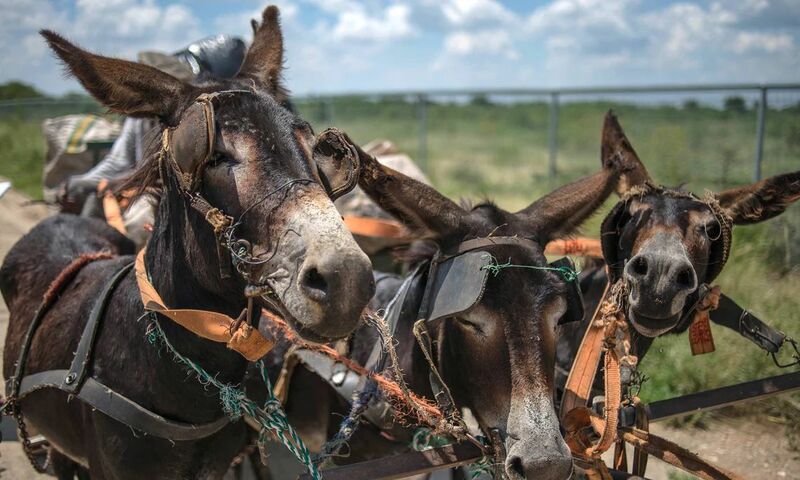 At one site in South Africa last August, a middleman who asked to remain anonymous bought 25 donkeys for a Chinese exporter and watched as the villagers killed them with knives and hammers. The exporter was arrested in Johannesburg a few months later for falsely declaring a shipment of skins to Hong Kong. Some governments are trying to regulate the sector. In February, in South Africa plans were announced to build abattoirs and train donkey farmers. “The projects will ... alleviate poverty, address inequality [and] create decent jobs,” a press statement said. But according to Dr Langa Madyibi from the provincial veterinary department, there has been little progress on this initiative beyond forming a Donkey Technical Committee and sending a government delegation to China last year. “We still have to work out the details, including our production model. There’s a wide range of stakeholders to consult,” Madyibi says. Some similar programmes in Africa have ground to a halt following community protests (in Ethiopia, Uganda and Tanzania) and national export bans (in Botswana). But other states have welcomed the investment opportunity, with Kenya opening three slaughterhouses in the last 18 months and Namibia set to build two. As governments grapple with the costs and benefits of supplying China, the ejiao sector grinds on, producing more than 5,000 tonnes of gelatine per year. The scarcity of skins has led to rising product fraud, with manufacturers substituting horses, oxen, pigs and even leather shoes as raw material. Deej, though, maintains a reputation for authenticity, and has won multiple prestigious awards, including the 2016 Chinese Brand of the Year. The company has a “near monopoly” on donkey skins and accounts for nearly 70% of all ejiao sales, according to an industry report. Deej, a state-owned company, did not respond to written questions by the reporter.